Woof- hi! Mal here from the Candy-Coated mystery series set on Mackinac Island. As you know, Mackinac is the fudge capital of the world and what better time to make fudge than around the holidays. Allie McMurphy-she's my human- is working hard to establish the Historic McMurphy Inn and Fudge Shop as one of the premiere stops for all the Fudgies who come to visit the island. It's rather tough when everyone seems to have already made up their mind about you. Luckily we have a nice group of family and friends to encourage us and to taste test our new fudge ideas. Speaking of fudge, typically puppies can't eat chocolate, but Allie has a peanut butter fudge recipe so easy that kids can make it and- as long as you keep a portion without chocolate- puppies can enjoy a lick or two. 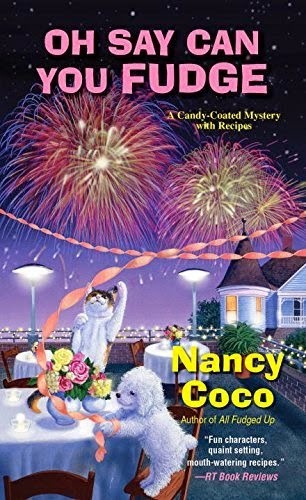 She said I could share this with you and if you want more recipes there are ten original recipes in each Candy Coated Mystery. One last bit, we're giving away a copy of To Fudge or Not To Fudge. So please leave a comment telling me what your favorite fudgie food is for a chance to win. Good Luck! In sauce pan over medium heat-melt butter and peanut butter together stirring constantly. Once melted take off the heat and beat in sifted powdered sugar 1 cup at a time until it forms a cookie dough like ball. Stir in vanilla. Choose a mixer like nuts or chips or sprinkles and stir them in. Pat into a buttered 8x8x2inch pan. Run a butter knife through it to cut desired piece sizes. Cover and place in fridge until cool. Once cool, run a knife around the edge of the pan to loosen. Pop out, break apart and serve. Store leftovers if you have any in an air tight container. Note: fudge must be cut before cooled or it will break. I like double-chocolate fudge with walnuts … well, actually, I like any type of fudge! Thanks for the recipe. I really love peanut butter fudge. I'm not much of a fudge person, too sweet, but maybe this recipe would be more my flavor. I might have to give it a try. Otherwise, fudgey brownies are very good! I like fudge but I can't have the dairy on it anymore. I'll be sure to try this recipe. It sounds delicious! My very favorite fudge-y flavor is peanut butter fudge - does that count? Peanut butter fudge is my favorite. I like to try fudge of all different flavors---this looks like an easy recipe to try. Thanks for the contest. I like the traditional chocolate fudge--and if it's a bit grainy, that's ok too! Thanks for the easy recipe to try. Fantasy fudge has been a family favorite for years - and the grands/greatgrands request it. What's not to like about a book featuring fudge? Thanks for the chance to win! Such a cute dog! Woof to you too! Actually, I don't really like fudge. I do like this series. I LOVE peanut butter fudge. Always my treat when sightseeing. Now I can make it myself and share with Pep the Pug. Love your book, thanks for the giveaway. Mmm fudge! Mocha, penuche, chocolate nut, and on and on. I Love fudge of every flavor!!! To read it, and eat it simultaneously would be doubly delicious! I usually make festive fudge ay Christmastime. I do a few simple varieties, but my favorite is the mint chocolate. I use mint chocolate chips and crush candy canes on top! When I make cranberry/blueberry pecan in white fudge for 4th of July or maple walnut, my family is happy! I love fudge! I've never tried peanut butter fudge, though. I sounds delicious! I really enjoy reading this series. That fudge recipe looks yummy. I think I will try it for the holidays. I love brownies or sometimes I can eat regular fudge. This sounds super easy. I'll have to try it for school. Fav fudge food ... I'd say brownies. But of course it must be accompanied by good ol ice cream. I like fudge but, being allergic to chocolate, I don't eat too much of it. My mom used to make the best but she quit about 20 or so years ago. So many good recipes coming out right now. I like brownies (with chocolate chips and nuts) with whipped topping. Milk chocolate fudge with pecans. Maple Fudge is my favorite. I like the recipe on the back of the Kraft marshmallow crème jar. It is smooth and creamy. I'm a simple girl with simple tastes ~ I'm happy with a hunk of plain ole regular fudge - yum! You had me at fudge. My M-I-L makes the best fudge with walnuts I have ever had! I look forward to it every Christmas!